Our updated e-shop offers you the capability of reviewing our products stereoscopically. to get your free pair of stereoscopic anaglyph glasses. The human brain perceives the external world stereoscopically. The calculation of the third dimension (depth) derives from the processing of two distinct images captured from each eye. With the use of special glasses that have different light polarization for each eye (similar to the modern sunglasses) and two specially polarized video projectors or a special 3D monitor. The disadvantage of this method is the need of special video projectors or a 3D monitor. The advantage of this method is that there is no eye-fatigue. Without the usage of special glasses. This is a rapidly advancing technology. An immense computer processing power and a special multi-D auto-stereoscopic monitor are required. The presentation with the use of this technology can not yet achieve high quality images. Auto-stereoscopic technology is currently used in advertisement with spectacular results. The simulators can display the virtual training area with the use of passive stereoscopic projection technology. 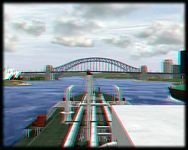 Trainees perceive the real stereoscopic virtual training area (port, passing by vessels, vessel’s engine room systems, etc) with the use of passive stereoscopic projection technology. Stereoscopic visualization is a break-through at nautical, aeronautical and tactical training. Stereoscopic presentation for data analysis is the only available way to get the whole picture at a glance. A typical application is the presentation of the gas leakages over the natural gas distribution network. The measurements are presented on a typical mapping system (e.g. Google Earth). The stereoscopic presentation of the data on the satellite-street map can assist engineers to isolate the critical gas leakages at a glance. Another application presents the oil to water (ppm) content measurement of an Oil Water Separator on a nautical chart. Another application presents the exact position and depth of the underwater communications’ cable. The only way to achieve a more than three dimension(x,y,z, ..) real time diagram is with the use of stereoscopic visualization technology. Applications are endless. Luxury yachts’ state of the art media centre system is now capable of projecting stereoscopic movies and video-games on modern 3-5-9D monitors and/or video projectors. Custom promo-video production for VIP guests viewing at auto-stereoscopic multi-D monitors (without need of special glasses) is also available.